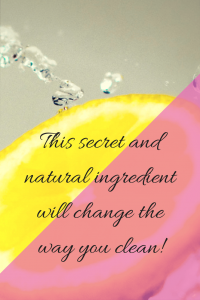 This secret ingredient is a must for cleaning solutions! Let me tell you one of the most annoying things about keeping a clean home in Italy: water calcium deposits. Its like an unpleasant, slow, magic show: just leave a few drops or a splash of faucet water on a surface, and once it has evaporated you will find a rough, grimy little crust of calcium in its place. You can try any soap you want, but unless you have the all-mighty Viakal, Italy’s trusted ‘anticalcium’ brand, there is no getting rid of it…. until I found its natural, and surprisingly much more effective competitor: citric acid. Sometimes with natural alternatives we have to adapt our expectations and compromise on results, but this is not the case. Citric acid sounds scary, but you most likely ingest it daily. It is a naturally occurring substance in fruits and veggies, and is added to soft drinks, ice cream, mayo, and many many more to add a tart, citrusy flavor. Citric acid crystals look just like granulated sugar! As a weak acid, it creates an environment unsuitable for bacterial growth by interfering with the proteins that allow bacteria to survive and reproduce- hence why citric acid is commonly used as a preservative agent in many foods, cosmetics, and pharmaceuticals. The low pH (acidic) is also added to some supplements to make it more biologically available for absorption. But let’s get back to its cleaning and descaling capabilities. In Italy we call it water with ‘calcare,’ in English we call it ‘hard water.’ What it means is that this water has the quality of having a high mineral content. As water is pumped from the ground or flows through basically any natural environment before reaching our faucets, it picks up minerals that are mostly comprised of calcium and magnesium. It is what causes those spots or residue on your glasses that come out of the dishwasher, and over time can cause damage to water-using appliances, like washers, coffee brewers, and boilers. Not to mention that calcium buildup interacts with soap’s ability to create suds, makes some cleansers less effective, and causes unsightly soap scum. Citric acid has the ability to react with calcium and break it up so that it can be easily wiped away. 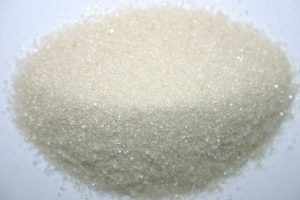 The acidity level is similar to vinegar, but citric acid is much, much more effective at descaling (removing calcium). Plus, if it were up to me, vinegar would be my main nectar in life for everything from washing to medicating, but my hubby detests the smell, as many people do, so finding a compromise I guess was only fair. *I don’t know if it is the quality or a chemical reaction when using some essential oils, but it has been my experience that the smell turns rancid and unpleasant quite quickly (within a couple days) when added to this recipe, so I just leave it unscented. Pour all ingredients together in a spray container, close it and shake until all the citric acid crystals have dissolved. The warm water should help with this process. Most recipes out there call for baking soda, but I don’t suggest adding it in. Baking soda causes the same reaction with citric acid that it does with vinegar: the two agents, when mixed and added to water will fizz- a chemical reaction that results in them canceling each other out. This would negate the cleaning powers of both agents. Windows: Make a spray solution of 1 cup warm water mixed with 1 tablespoon citric acid (optional: 1 tablespoon rubbing alcohol or vodka). Swirl the solution till all the crystals are dissolved, spray on windows, and wipe away. Coffee/tea stains on mugs: I dab a moist wash cloth in some citric acid crystals, then use it to scrub the inside of the mug. Basically a mug scrub. Treat yo’ self: For fabulous bath bombs (and great gift ideas) mix together 2 cups baking soda, 1 cup citric acid, 1 cup cornstarch, 1 tablespoon oil of choice, and essential oils to your heart’s content. To make them into shapes, spray/sprinkle in some alcohol (rubbing alcohol or vodka) a little at a time until the mixture starts to clump together like damp sand. Pack batches of it tightly into a mold of your choice, let it dry, then pop them out for use or gifting. Basically, citric acid is awesome and it should become one of your household staples for cooking and especially cleaning. It’s not terribly hard to find, you just need to know where to look, like stores that have jam-making supplies, health food stores, or bulk cleaning and soap making stores. Here in Italy you can buy it at any home cleaning or organic grocery store. If you would like to venture into even more natural alternatives for cleaning, check out this awesome recipe for dish soap that harnesses the powers of lemons! As always, please feel free to share any insight or tips on using this awesome ingredient. I have either thoroughly researched and/or used the products myself, and some may come from affiliated programs such as Amazon affiliates. This does not affect your purchase in any way, it just allows me to receive a small commission in return.